The weather today is spectacular, sunny with expected highs in the 60s. Clarence and I are going to the Mt. Cammerer Lookout, picking up the hike we scuttled a few days ago due to the storm. 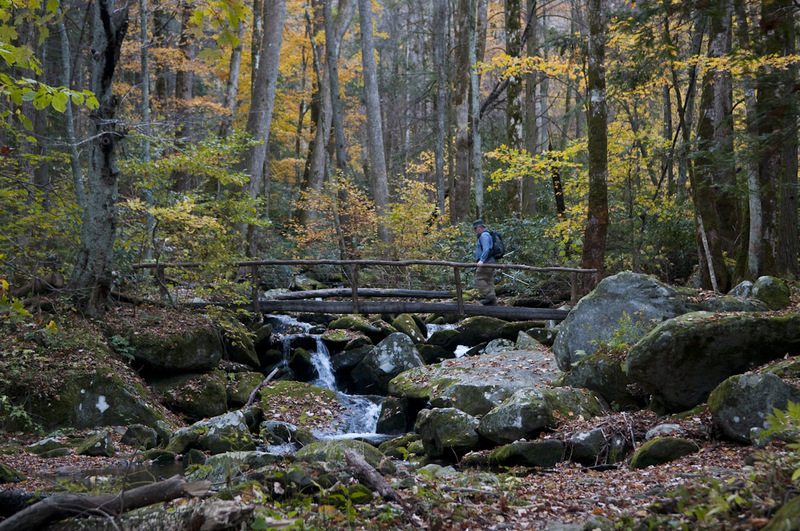 Not far from our campsite, there is a 0.4 mile spur trail that joins Low Gap at 0.8 mile. Perched on top of the trail sign is a pair of lost sandals patiently awaiting their owner. We start out here along with John, a hiker from Indiana, whose company we share to the lookout. Low Gap Trail is 2.9 miles long from its actual beginning in the hiker’s parking lot. It is slow to add elevation at first but gets steeper as it nears the crest. The trail climbs between Cosby Creek and Rocky Face Mountain rising from 2200 to 4242 feet, one of the lower elevations along the Appalachian Trail within the park. We are northwest of the crest, and morning sun does not reach us. Our physical effort helps keep us warm. Chills set in when we chat with John a bit too long during a break. Sugar Maple, Umbrella Magnolia, Sharp-lobed Liverleaf, and Dutchman’s Pipevine enjoy the rich, protected cove of Low Gap’s lower section. Blue Wood Aster is in flower here along with a few Goldenrods. 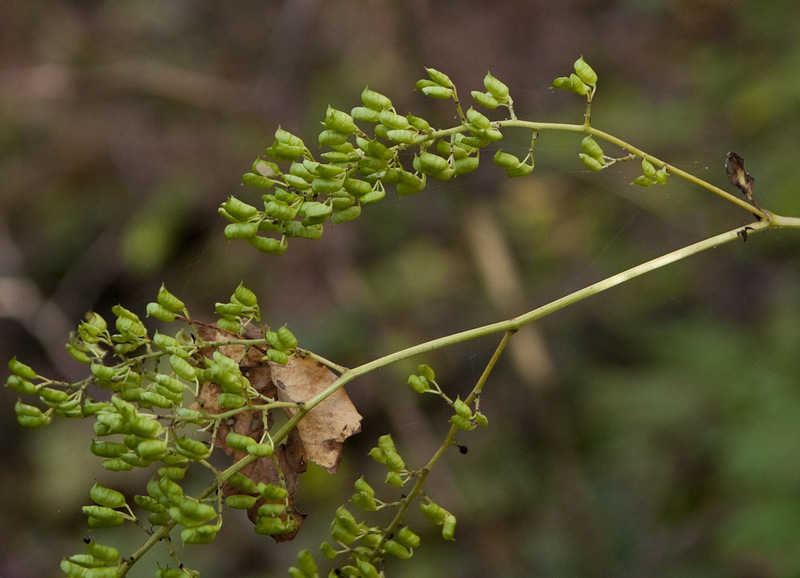 Black Cohosh and its relative Mountain Bugbane are both in seed. The latter waving tall wands loaded with capsules that look like tiny green pea pods even though it is not in the pea family. Nearing the crest the canopies of oak trees light up like torches in the bright sunshine. Clarence, John and I are surprised when we arrive at Low Gap. The hike did not seem long or particularly taxing. That’s what good conversation on a gorgeous autumn morning can do for you. We meet a couple from Chicago who are also headed to the lookout when they finish their midmorning snack. Our climb is far from over. We must travel 2.1 miles along the AT to reach Mt. Cammerer Trail, and most of it is up. Yet it passes as easily and pleasantly as Low Gap. It takes a little rock climbing to get to the Mt. Cammerer Lookout. Mt. Cammerer Trail is a mere 0.6 mile long and hovers just under 5,000 feet. All the expected high elevation plant life is here, much of it exploding in a riot of red. Mountain Laurel and Rosebay Rhododendron enclose the trail in muted green walls. 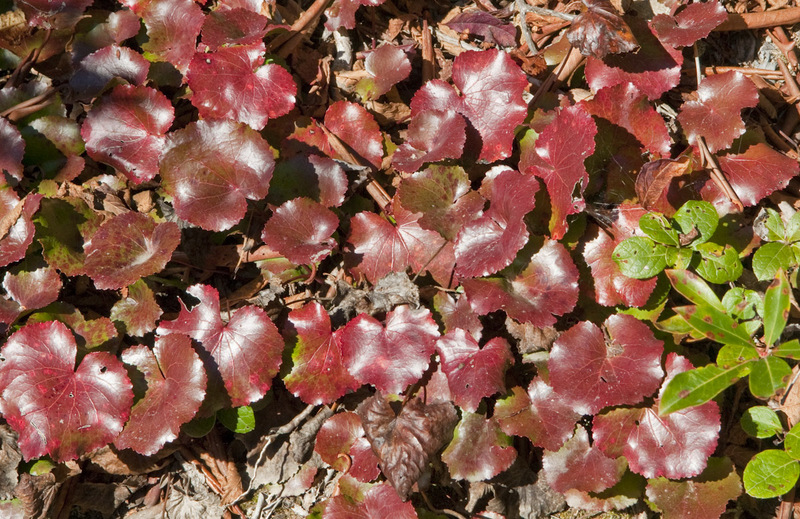 Galax (scarlet to deep carmine) and Teaberry (dusky maroon) brighten the trailsides amid near colorless Reindeer Lichen. Fire engine red fruit clusters of Mountain Ash and deep green needles of Red Spruce complement each other. Highbush Blueberry and Red-twig Doghobble are locked in a battle of fall color oneupmanship. There is quite a bit of scrambling over boulders large and small to get to the lookout. Hands are needed nearly as much as feet in some places. It is worth the effort. The eight-sided building is a work of art. 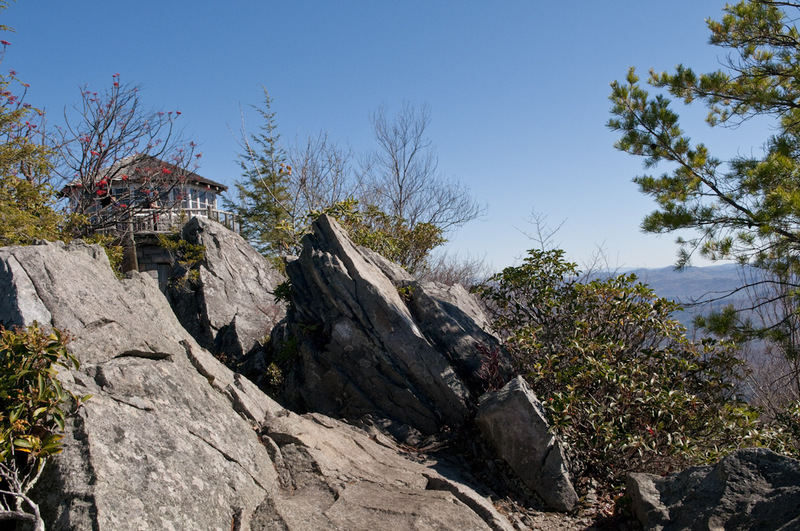 Located on a rocky prominence, the stone building offers a 360 degree unobstructed view of the surrounding landscape. Technically, Mt. 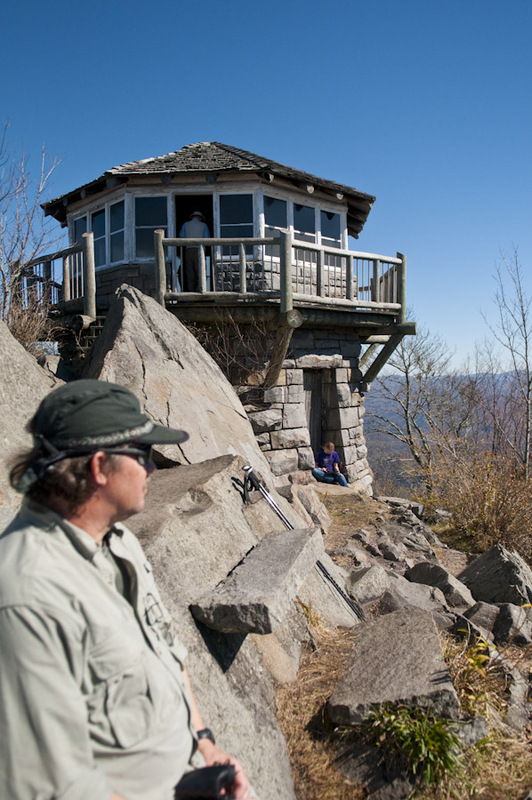 Cammerer’s edifice is considered a ‘lookout’ rather than a ‘fire tower,’ as it is just two stories high and sits on the ground. From this vantage point, simply look south to see a real fire tower. Even without the aid of binoculars, Mt. Sterling’s 60’ tall metal structure rises well above surrounding trees in the distance. Mt. Cammerer’s lookout was built in the late 1930s. Masons shaped rock quarried from the mountains by the Civilian Conservation Corps. Typically four sided and in line with compass points, a square lookout would not fit this site, thus the octagonal shape. Actively used until the 1960s, it fell into disrepair requiring reconstruction in the mid 1990s. The mountain and the lookout are named for Arno B. Cammerer, National Park Service director who supported the creation of Great Smoky Mountains National Park. After soaking up the views, Clarence and I lean back on exposed rock to soak up some sunshine and eat lunch. We eavesdrop on other visitors’ entertaining conversations. 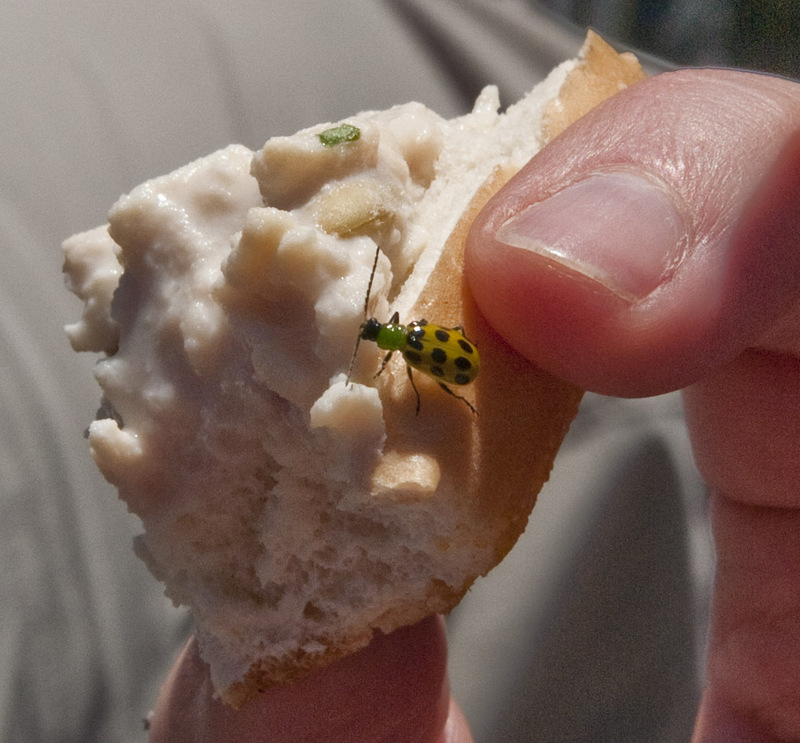 I share some of my lunch with a colorful Spotted Cucumber Beetle. Its yellow wing covers have 12 large black spots, and the pronotum (hard plate on the front of the thorax) is bright green. As a larva, it is called the Southern Corn Rootworm and is loathed by farmers. As an adult, it is equally loathed for eating the leaves of many crops including cucumbers, soybeans, and cotton. This guy, though, is eating my freshly rehydrated Mountain House chicken salad. Hmmm? So what is in this stuff? Honestly, it is quite tasty. Clarence and I each have a loaded wrap and a bagel, with enough filling left over for a third person or a very hungry Spotted Cucumber Beetle and hundreds of his friends. Just as we are preparing to leave, three older gentlemen arrive. Salt of the earth East Tennessee boys sporting among them a cowboy hat, set of overalls, University of Tennessee ball cap, and three pistols strapped around their waists in plain view. They came up on horseback. Long stems of Solomon's Seal are nearly twice the length of my trekking pole. The hike back to Cosby is even more pleasant because we are going downhill. 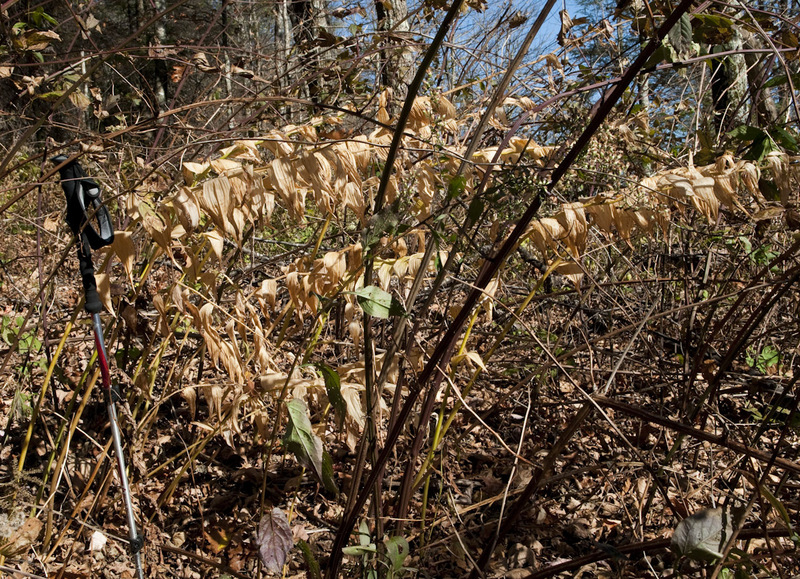 At the AT/Low Gap junction, I spot a cluster of Solomon’s Seal stems that must be 5 to 6 feet long. The leaves have already faded from yellow to tan. For a while, botanists considered this Giant Solomon’s Seal to be either a separate species (Polygonatum commutatum) or a variety of regular Solomon’s Seal (Polygonatum biflorum var. commutatum). In general, plants are often found with multiple sets of chromosomes; tetraploids with four complete sets are common. These plants are usually larger with bigger and more numerous flowers. The Giant Solomon’s Seal is recognized as a tetraploid, but P. biforum is a highly variable species regarding size, flower number, and ecology. The Flora of North America states that some diploids can be as large as the tetraploids. Since the only difference is one of size, most taxonomists now consider all varieties large or small to be P. biflorum. 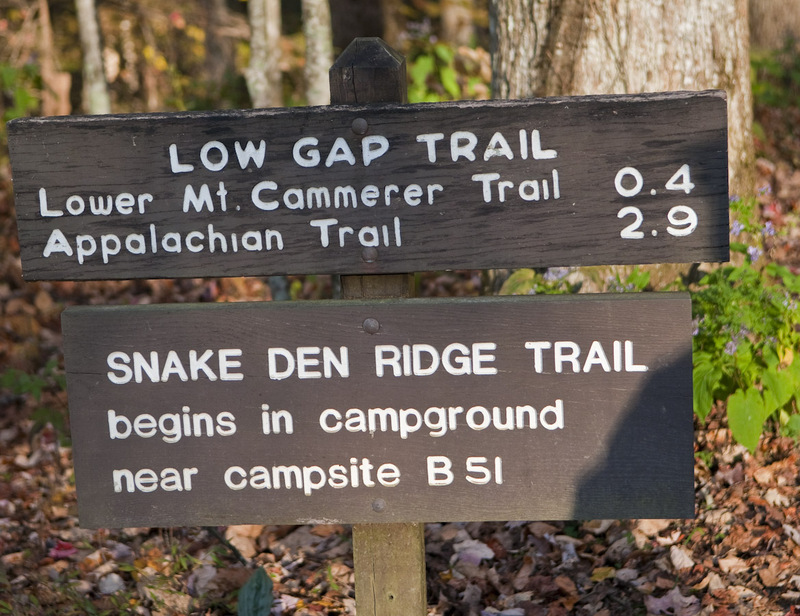 We follow Low Gap to its true trailhead in the hiker’s parking lot at Cosby, walking past the Nature Trail and behind the amphitheater. 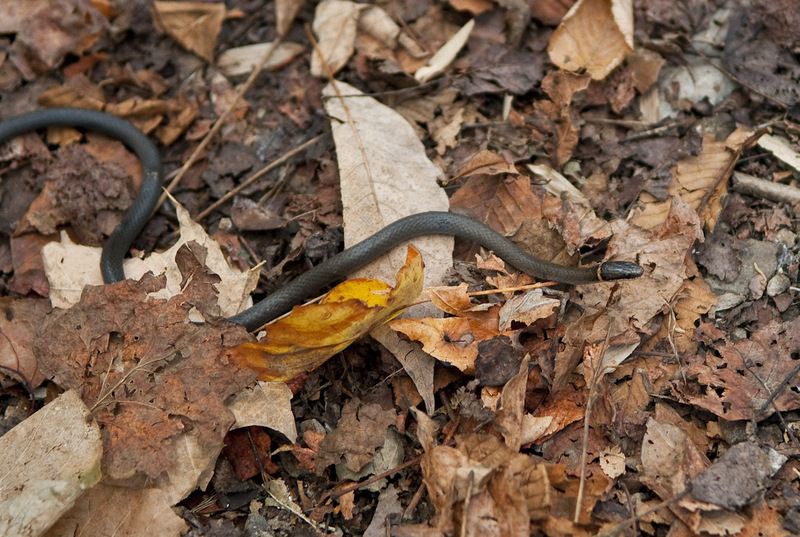 As we near the end, Clarence sees a Northern Ring-necked Snake lying perfectly still in the trail, its head raised slightly. I take a final photo of the trailhead sign but fail to notice the perfect Puttyroot leaf in the background until I am reviewing the images at home days later. Check out the Puttyroot leaf at the bottom of the photo!